EUROPE: Wind energy capacity will grow at an average 17.4GW per year up to 2022 across the continent, according to a new report by WindEurope. The trade body forecasts 86.9GW will be installed over next five years, reaching a total of 258GW in operation in Europe by 2022. Germany, Spain and the UK will continue to lead Europe for highest national capacity, but countries such as the Benelux nations, Norway, Turkey and France will all make important contributions to the 258GW total. Globally, Europe will account for a quarter of new total capacity additions by 2022. However, WindEurope makes its 17GW-a-year forecast despite figures revealing just 4.5GW was added in the first half of 2018 - a decline of 26% year-on-year. It also argued that with more encouraging policy frameworks in place, even more new capacity could be added in the next five years. The majority of the 86.9GW increase will be onshore, WindEurope stated in its report, Wind energy outlook in Europe: 70.4GW (81%) compared to 16.5GW (19%) of new offshore wind. Currently, onshore wind accounts for 90.7% (160.2GW) of Europe’s total installed capacity of 176.5GW, according to Windpower Intelligence, the research and data division of Windpower Monthly. 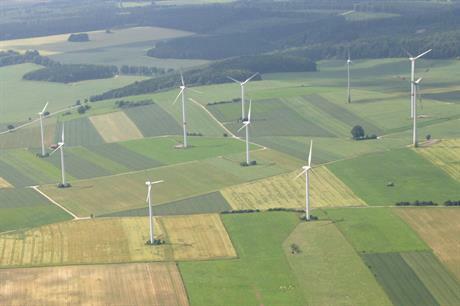 The increase beyond 250MW will in part be driven by larger turbines, WindEurope stated. It added that 4MW-plus onshore turbines and 8MW-plus offshore machines will become more commonplace over the next five years. Germany will remain the country with the most installed capacity, reaching 73GW in 2022, up from 59GW today. Spain (30GW by 2022, up from 23.2GW today) and the UK (26GW by 2022, up from 19.3GW today) will remain in second and third place, WindEurope stated. However, due to strong growth in other countries, Germany’s share of the new installations will fall from 40% on average over the last five years to 24%, it added. Germany’s slowing growth can be attributed to botched auctions and difficulty in delivering power from the wind-rich north of the country to load centres in the south, the trade body argued. As well as new additions between 2018 and 2022, repowering offers an opportunity for Europe to increase its total capacity, WindEurope argued. However, of the 22GW of installed capacity that will be more than 20 years old by 2022, between 4.3GW and 6.4GW could be fully decommissioned rather than repowered, it stated. This is due to unclear repowering policies throughout the continent, WindEurope explained. WindEurope CEO Giles Dickson said: "Wind energy is on track for solid further expansion in Europe over the next five years, but this growth comes mostly from yesterday’s decisions. "The outlook for new investment decisions over the next five years is less clear. "Most governments still haven’t clarified their plans for new wind farms up to 2030, and partly because of this, it’s getting harder to secure permits for new wind farms." He added that EU-mandated National Energy and Climate Plans (NECPs), which provide a framework for member states to set out their climate and energy objectives, targets, policies and measures through to 2030, will be "crucial". Dickson explained: "They’ll define the volumes of new renewables countries want and how and when they propose to auction the new capacity. "The NECPs also require governments to articulate their plans for existing renewables that come to the end of their life between now and 2030." He added: "This is getting urgent."